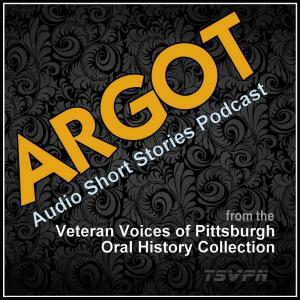 On this episode of Argot: Audio Short Stories from the Veteran Voices of Pittsburgh Oral History Collection, WWII veteran Francis Rifugiato of Pittsburgh shares a story about the death of his army buddy Charlie and his own fortunate life, as originally told in May 2012 to the Veteran Voices of Pittsburgh Oral History Initiative in Pittsburgh, Pennsylvania. This audio short story is engineered and produced by Kevin Farkas. Francis served in an Army band until the need for combat infantrymen broke up the band and sent him into the 12th Armored Division. He boarded a troop ship in September 1944 and landed in France in November. Being a member of a headquarters company, Fran wasn’t involved in offensive operations, but he saw a lot of combat nonetheless. “I’m very lucky,” he says. Not so lucky was Fran’s best friend Charlie, who was a musician like Fran. Charlie’s death still haunts Fran, these many years later. Note: Fran Rifugiato was among the first Pittsburgh area WWII veterans to share his story with our oral history project. We are forever grateful for his generosity–and courage–in sharing his often difficult and painful war experiences with us so that future generations will know of his generation’s sacrifice and service. Fran died on September 28th 2014.